L. Berkley Davis Jr. is at the center of power. Electric power, that is. Dr. Davis is known internationally for innovations leading to the development and worldwide implementation of low-nitrous-oxide-emission gas turbines for electric-power generation. For more than three decades, his contributions to combustion evolution have made their mark at General Electric and in the power industry at large. As a result, in 2006, he earned one of the highest honors in the engineering profession — election to the National Academy of Engineering. Members are elected to NAE membership by current NAE members. Members have distinguished themselves in business and academic management, in technical positions, as university faculty and as leaders in government and private engineering organizations. Dr. Davis’ membership citation made note of his innovations leading to the development of low-nitrous-oxide emission gas turbines. To say the least, engineering was a topic of interest in the Davis household as Dr. Davis was growing up in Owensboro. His late father, Lewis Berkley Davis, Sr. was a UK engineering graduate and is also a member of the Hall of Distinction. While his father’s career made engineering part of daily life from early childhood, it was around age 15 that Dr. Davis began to develop a serious interest in the field, inspired partly by flying lessons and an overall interest in aviation. His college decision was influenced by the many UK-related stories his father had told. Dr. Davis earned a Bachelor of Science degree in mechanical engineering in 1966. Faculty members such as Robert Drake, Clifford Cremers, John Lienhard and Roger Eichhorn, the department chair at the time, had a positive influence on his undergraduate experience. While the family background may have drawn him to UK for undergraduate studies, his decision to pursue Master’s and Ph.D. degrees at UK was made based on what he saw during his undergraduate days — a commitment by UK President John W. Oswald to improve the quality of the institution. Especially important to Dr. Davis’ future as a graduate student was the naming of Dr. Robert Drake as dean of the College of Engineering. Dr. Davis recalled that Dean Drake built a strong engineering program at UK during his tenure. 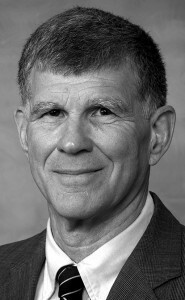 Dr. Davis earned a Master’s degree at UK in 1970 and a Ph.D., also from UK, in 1972. He worked on an unusual topic as he pursued his Ph.D. — energy transfer in fur. Career advancement came quickly. Dr. Davis joined General Electric and very soon moved into a leadership role on one of the vital issues facing the company — anticipating and solving problems related to emission controls, which were growing tighter. Over the years, he has earned a reputation for excellence in improved design practices, computational fluid dynamics tool development and control schemes. His valuable and imaginative technical contributions have met the difficult challenge of reducing emissions with higher firing temperatures of high-technology gas turbines. Dr. Davis is known for his expertise in land-based gas turbine systems engineering, combustion design and emissions control. He calls the work on low emissions systems for power plants the most diffi cult work he has done, but also the most satisfying, because it involved taking a new technology and making it work in an actual power plant. Building and running a strong crossfunctional engineering team was also a challenging and rewarding part of the work. Dr. Davis was named a Fellow of the American Society of Mechanical Engineers in 2000, another in a long list of honors and awards. He also received the General Electric Steinmetz Award in 1991, and several other internal awards from GE, including the Intellectual Property Award for Outstanding Issued Patent in 2005, Outstanding Technical Contribution in 2000, Six Sigma Award in 1999 and the Business Initiatives Award in 1994. He holds over 100 patents. Since 1998, Dr. Davis has held the position of chief engineer, systems, at GE. He and his wife, Kathy, reside in Niskayuna, New York.